Making a profit is no longer sufficient. Your shareholders want you to beat expectations today and have an eye on the future. Your customers ask for solutions, not products. Your employees wonder how they can outmaneuver big players and agile start-ups at the same time. The list continues but the principle is clear: your company is pulled in different, sometimes opposing directions. Learning from two extremes of success – large companies that excelled for more than 100 years and entrepreneurial entities worth at least $1 billion – will help you to excel in this environment. Join us for our knowledge session to learn more about the principles of success in both the long-term and short-term. Kindly fill in the registration form below to register for the event. Select the programme which you are an alumni. Where did you hear about the knowledge session? Christian Stadler is a Professor in Strategic Management. Prior to joining Warwick Business School he was at University of Bath School of Management, Tuck School of Business at Dartmouth, and Innsbruck University. Christian is an expert on long-term success. For the past decade he devoted his energy to the investigation of long-living corporations – how they grow, adapt, and consistently beat their competitors. His work has been featured in the Harvard Business Review, Sloan Management Review, New York Times, Wall Street Journal, Financial Times, Bloomberg Business Week, Fast Company, Fortune/CNN, and the BBC, and has been translated into 11 languages. 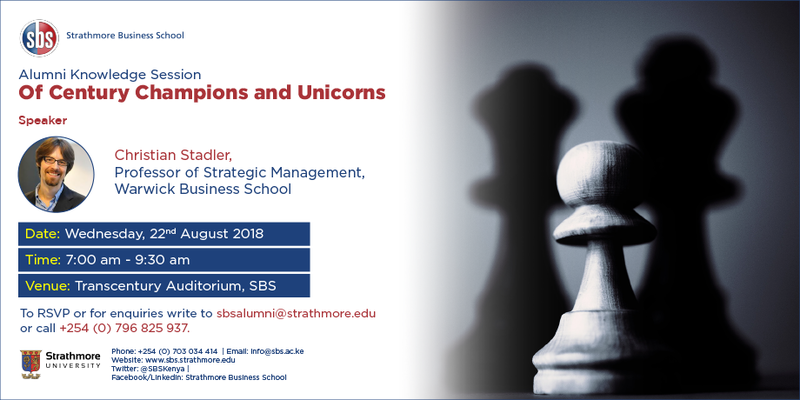 For more information write to sbsalumni@strathmore.edu or call +254 (0) 796 825 937.